The Gospel of Mark, anonymously written but traditionally ascribed to Mark the Evangelist, is a synoptic gospel of the New Testament. It narrates the life of Jesus from John the Baptist to the Ascension, but it concentrates particularly on the last week of his life (chapters 11-16, the trip to Jerusalem). Its swift narrative portrays Jesus as a heroic man of action, an exorcist, a healer and miracle worker. It calls him the Christ (the Greek translation of Messiah), the Son of Man, and the Son of God. 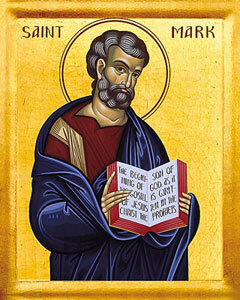 Two important themes of Mark are the Messianic secret and the obtuseness of the disciples. In Mark, Jesus often commands secrecy regarding aspects of his identity and certain actions. Jesus uses parables to obscure his message and fulfill prophecy (4:10-12). At times, the disciples have trouble understanding the parables, but Jesus explains what they mean, in secret (4:13-20, 4:33-34). They also fail to understand the implication of the miracles that he performs before them. Christian churches have traditionally interpreted Mark to be based on the Gospel of Matthew, an epitome, and it is placed after that gospel in most Bibles. However, most contemporary scholars regard it as the earliest of the canonical gospels (c 70). According to the two-source hypothesis, it was one source for material in the other synoptic gospels, Matthew and Luke. Mark was associated with Paul and Barnabas (who was Mark's cousin) on their missionary journey through the island of Cyprus. Later he accompanied Barnabas alone. We know also that he was in Rome with Peter and Paul. Tradition ascribes to him the founding of the Church in Alexandria.